Thanks to New York City’s Economic Development Corporation, the residents of Midwood are about to enjoy a wider selection of produce and kosher foods. Under the FRESH program, Moisha’s Discount Supermarket is slated to receive just under $2 million in tax breaks to double its size and provide more grocery options to the underserved community [PDF]. Along with 15,000 square feet of supermarket, however, the neighborhood will be receiving 18,000 square feet of parking. According to Moisha’s application for city support, most of that parking will be built on the roof of the new store. According to the city Industrial Development Agency’s notice of public hearing, however, it will be regular surface parking taking up half of the 36,000 square foot lot. Either way, that much parking is overkill for Moisha’s. The supermarket’s environmental assessment, for example, estimates that 18,000 square feet is enough space for 45 cars, but that a maximum of 40 vehicular trips could be generated by the store in any given hour. In other words, by the store’s own calculation, unless most customers are spending hours at a time shopping, it’s providing more parking than it would at any point have driving customers. 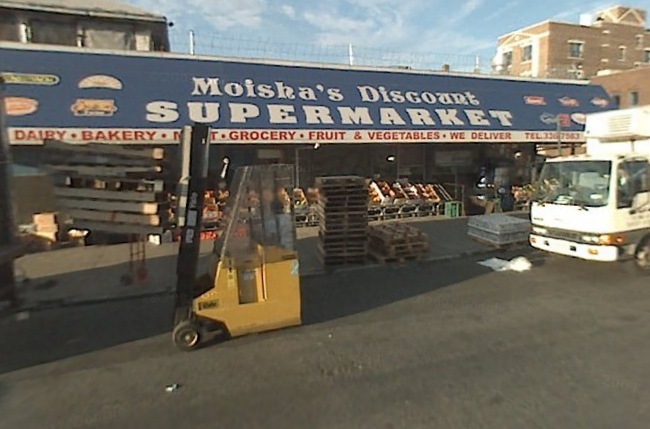 Other options abound: In addition to plain old walking, Moisha’s is located around four blocks from the F train at Avenue N, and the store’s website advertises its delivery service. Perhaps more importantly, the entire purpose of the FRESH program is to make high-quality and affordable groceries available to residents who don’t have access to them. People who drive to the supermarket aren’t so constrained by what’s available in the neighborhood. That’s why the U.S. Department of Agriculture defines households as living in a food desert if they’re more than a mile from the nearest grocery store and they don’t have a car. FRESH-supported supermarkets are in that sense supposed to cater to those on foot, on bike, or on the bus. To the city’s credit, the FRESH program makes important nods toward the inconsistency of large parking lots in its supermarkets. In addition to providing tax incentives, FRESH also cuts parking minimums for participating stores: The first 15,000 or 40,000 square feet of the store, depending on the location, don’t require any parking under FRESH. Taking those guidelines into account, it appears Moisha’s is probably providing all that excess parking — which is sure to induce more driving in the neighborhood — of its own accord, rather than because of any city-mandated minimums. Even so, Moisha’s is a perfect example of how when it comes to parking, EDC needs to do better. EDC calculates, for example, that helping Moisha’s expand will create around $3.7 million in new tax revenues over 25 years, but the agency doesn’t break down how they reach that figure. That leaves important questions unanswered. For instance: Would the Moisha’s project provide more economic benefit if, instead of devoting so much space to car storage, EDC helped them build housing or additional retail space? EDC did not respond to Streetsblog’s request for that information. Another way of looking at it is NYC is spending more to build parking at a midsize supermarket than it has on its entire citywide bike network. Just looked at EDC website. Does this address qualify for the funding? That part of Midwood looks maybe a little less dense than Park Slope, but not much less. Can anyone imagine building a parking lot at the Key Food at 7th and Carroll, or at Steve’s C-Town on 9th Street? Are we sure EDC doesn’t stand for Environmental Destruction Corporation? Why doesn’t somebody sue the city to stop this? Maybe get Jim Walden to take it on pro bono like he’s doing to stop the PPW bike lane? I know nothing about this market or the local area, but if you’re going to give away $2 million in tax breaks, why not just move the market next to a big transit stop/elevated rail stop? Wouldn’t that serve more of the “underserved”? The “underserved” need to be spending their money on better quality food ingredients (to keep themselves healthy), not on cars/fuel to get themselves to the market. The poor could often afford organic food for the same price they spend on convenience foods, which offer little value for the money. I shop there from time to time for a few specific items when I can get a hard to find parking space. I usually see 30-60 customers in the store, most with full carts with the aisles so crammed you can not move. The closest real supermarkets are on Avenue I and McDonald Ave or 60th street and 13th Ave, neither close. The only large produce store anywhere near is on McDonald and O. The present store was a Key Food many years ago. I would welcome any parking spaces although I myself always prefer to park on the street.